Three years ago, Spokane civic leaders convinced the state Legislature to allow Washington State University to create a new medical school in Spokane. The Eastern Washington city now has more first- and second-year students studying medicine there than in Seattle. SPOKANE — This year, more new medical students are starting their careers in Spokane than in Seattle. Why does it matter? Here in Washington and elsewhere across the nation, there’s a shortage of physicians in rural areas and small cities, a problem that’s expected to worsen as a generation of baby-boom doctors retires. The hope is that getting students to train in Eastern Washington will sway more of them to stay east of the mountains, or to make their homes in smaller communities and rural areas, and to focus on primary care instead of specialty medicine — known for being more lucrative. In all, 240 first- and second-year medical students are taking the first steps toward careers as physicians in Spokane, either at Washington State University’s year-old Elson S. Floyd College of Medicine or at the University of Washington’s Spokane location, run in partnership with Gonzaga University since 2016. Despite the expansion in Eastern Washington, it’s still not enough. If all the students training at both UW-Gonzaga and WSU stayed in Washington, “We’d still have a gap of 100 to 150 doctors a year,” said WSU medical school Dean John Tomkowiak. Western Washington is still the epicenter of medical training for the region. Many student physicians will finish their third and fourth year west of the mountains, and most medical residencies — the graduate-level training that happens after a student completes four years of medical school — are located in the Puget Sound area. But at least for the first two years, more new docs are in Spokane than anywhere else in a five-state region. The schools have also brought about $23 million in new research dollars to Spokane. “It raises the bar of education” in Spokane, said Mike Wilson, the retired CEO of Providence Health Care Spokane, who now chairs the community-advisory board for the UW-Gonzaga regional-health partnership. One day, one of her students overdosed on heroin in the college’s bathroom. “I saw it coming, and I didn’t know what to do,” Thomas said. “I didn’t have the tools to prevent it — no training, no background.” The student survived, but for Thomas, it was a pivotal moment. After spending years helping other students get into medical school, she decided that she, too, wanted to become a doctor. And she found her medical-school fit in Spokane, at WSU’s College of Medicine, rather than in Seattle. For years, Spokane civic leaders tried to create a medical school there. The issue played out in the Legislature, which in 2015 voted overwhelmingly to change a provision in the law that allowed only the UW to operate a medical school. That paved the way for WSU to start its own. Not without a fight. 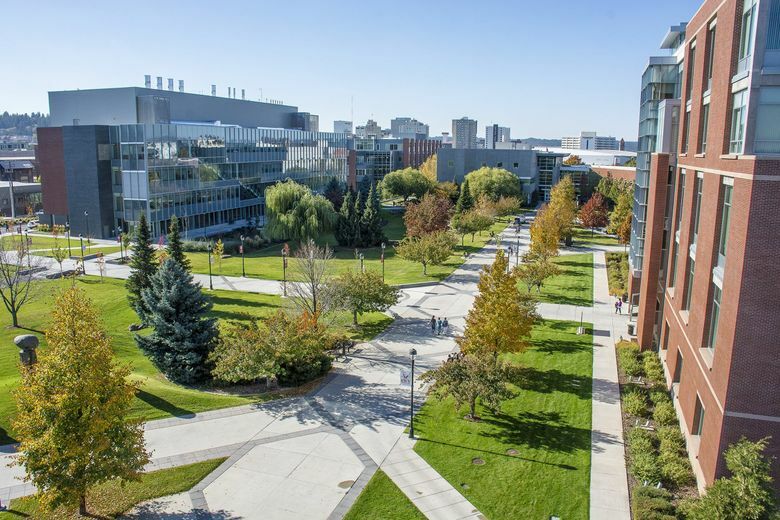 The UW, which had run a small medical-school program in Spokane for several years, argued that it was cheaper for it to expand its efforts than for WSU to create a new school — and a state audit last year underscored the ongoing cost difference. A year of medical school costs about $125,960 per student at WSU, and $90,640 at the UW School of Medicine, although at least some of the higher cost at WSU is due to the startup expenses of a new medical school. In-state, first-year medical-school students at either school pay about $37,000 in tuition. The difference in cost is funded by taxpayers, as well as philanthropic gifts and money from the schools’ own coffers. After WSU won the right to build a medical school, WSU and UW called a truce, and today, they say, they’re working amicably together. The UW switched partners, forging an alliance with Gonzaga University, a private Jesuit school. The two campuses are a 10-minute walk from each other, on either side of the Spokane River, and they share an anatomy lab on the WSU campus. For students, Spokane’s cost-of-living is substantially lower than Seattle’s, which keeps the bills down and could make it more likely that they will stay in primary care, where the need is greatest. All the students studying at both schools are Washington in-state residents. WSU does expect to grow its college, admitting 80 first-year students next year, or 20 more than it did this year. The UW-Gonzaga partnership also plans to increase its annual enrollment from 60 to 80 students, although not immediately. After WSU’s students finish their first two years in Spokane, they’ll fan out across the state — about a quarter will stay in Spokane, and the rest will go to Everett, the Tri-Cities and Vancouver. “Our mission is to serve the entire state,” Tomkowiak said. Many students studying at the UW’s Gonzaga location will also leave Spokane, for clinical rotations, after they finish 18 months of study. The students who chose Spokane are older, and more are women — in keeping with a national trend of more women than men entering medical school. At UW-Gonzaga, the 2018 entering class included 38 women and 22 men. At WSU’s Floyd College, 36 are women and 24 are men. They’re also a few years older. They’re students like Philip Bohlmann, who’s 33 and holds a bachelor’s degree in studio art. After college, Bohlmann discovered that he liked medicine, and trained to be an emergency-medical technician (EMT), even teaching some classes. But soon Bohlmann began to imagine himself in a different role — not as a first responder in a medical crisis, but as the doctor who could put things right in the medical center. As an EMT, “I could know every single thing that was happening with a patient, and I still could only just drive them to the hospital,” he said. He was accepted to WSU’s College of Medicine, and this summer moved from Seattle to Spokane. Of all the medical schools he visited, “This was the only one where I had visions of myself actually being a student here,” he said.